Skin Toner are often treated “we can skip it” step. Sometimes the wrong one can give you break outs and mal action. But the right kind of toner can retain the youthful glow of the skin.Today I am going to write about Just Herbs Myrrh-Sandalwood Restorative Skin Tonique.The toner smells of sandalwood, almost feels like sandalwood water. 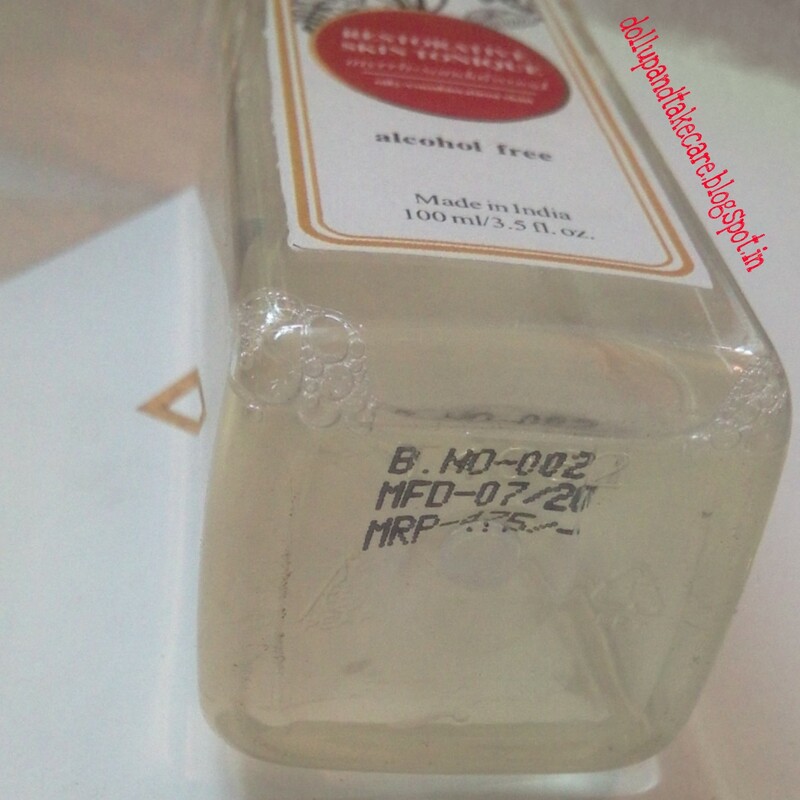 I love the fresh feeling it gives to my skin.I preffer storing it inside refridgerator.I received this on the month of October and till November I preffered storing it there. A harmonious alcohol-free blend of steam-distilled waters of Myrrh, sandalwood and certified organic Aloe Vera juice to remove the last traces of dirt and grime and cleanse skin pores. Myrrh is a powerful anti-oxidant known fight skin ageing and has been used as a wonder-herb to maintain youthful skin since antiquity, while sandalwood cools, soothes and nourishes dull and tired skin. Indian senna extract imparts this product anti-bacterial, anti-inflammatory and skin soothing properties. After returning home, I apply it with the help of a cotton ball. 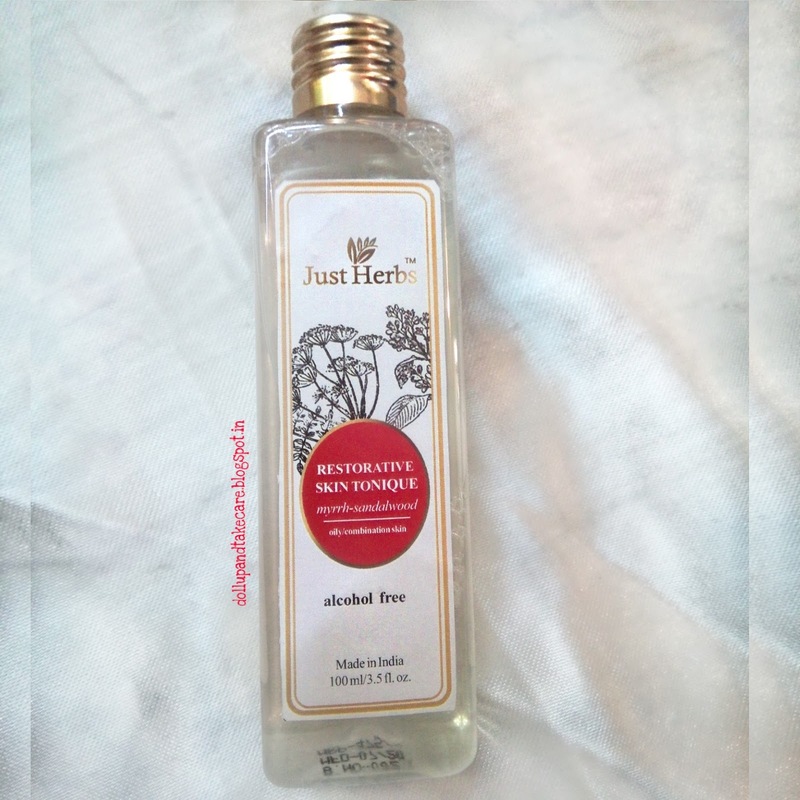 My skin feels refreashed, pores indeed feels clean and tightened.I had some pimple marks that did not lighten but theor texture improved so much that they appear lighter. Regular use of it ,is helping my skin look better.Well, I feel the regular use of this product will work really well to give a better skin . It is free from all drying agent. Rs 475/- for 100ml is a bit on expensive side.